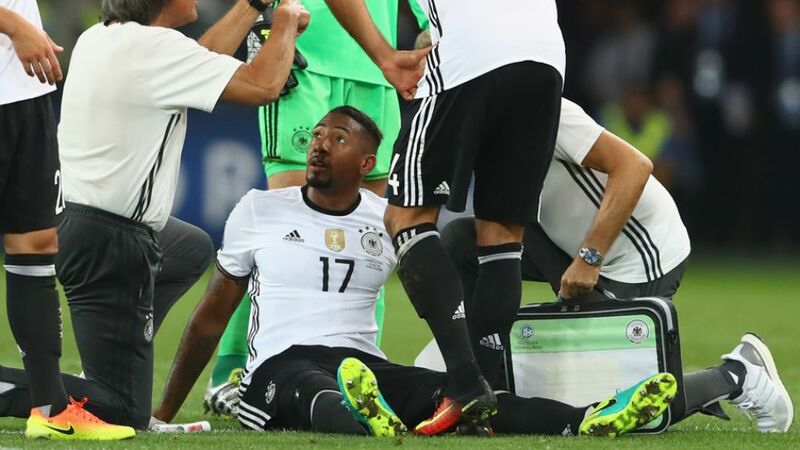 FC Bayern München defender Jerome Boateng will be fit for the start of the 2016/17 Bundesliga season, despite sustaining a thigh injury while on international duty with Germany at UEFA EURO 2016. The 27-year-old limped off the field after 59 minutes of Die Nationalmannschaft's 2-0 semi-final defeat to tournament hosts France on Thursday, having been instrumental in helping the reigning world champions reach the latter stages of the competition. On Friday Boateng returned to Munich, where he received treatment at the surgery of Dr. Hans-Wilhelm Müller-Wohlfahrt, the chief medical officer of the Germany national team. Although a scan revealed Boateng had suffered a muscle tear in his right thigh, the defender will be fit for Bayern's season opener against SV Werder Bremen on Matchday 1. New signing Mats Hummels, who missed the defeat to France through suspension, has no fitness concerns, while Holger Badstuber is currently working hard on his comeback from injury.